It feels a bit odd rolling out holiday collection posts already, but holiday collections are slowly being released and these are just too good not to get up right away. 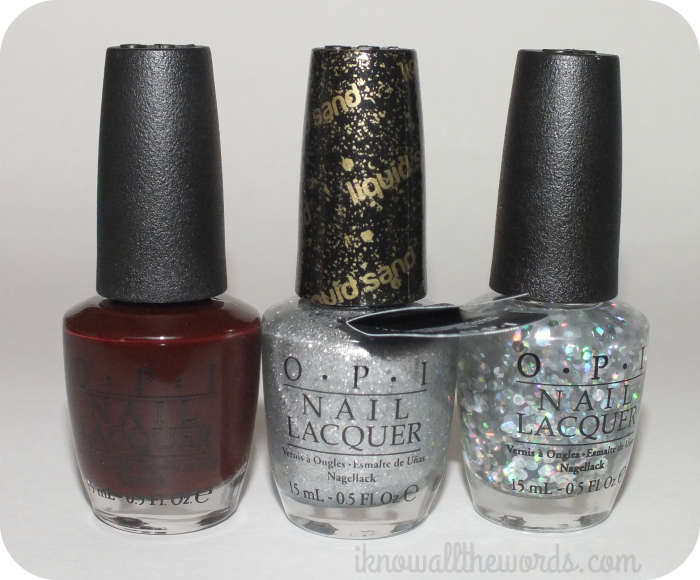 I posted the promo shots of the OPI Mariah Carey Holiday Collection last week, and today I have three of the eighteen shades to share. Read on for swatches! This huge collection features twelve creams and glitters and six liquid sand shades- which are quickly becoming some of my favourite polishes- which don't all immediately say holiday collection, but do have a wintery theme when all is said and done. Vampy-red/plum fans will definitely be happy as the collection has six shades in that family. From the bottle shots it's hard to tell exactly how unique they will be, but they do look promising. 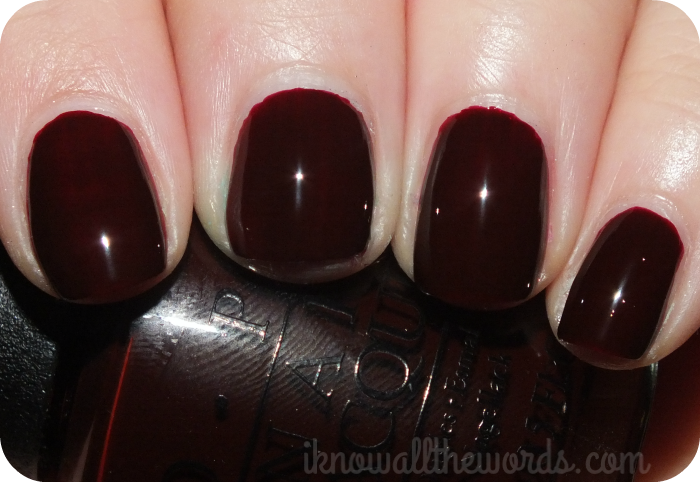 Visions of Love is described by OPI as being a rich burgundy, but the shade also has a chocolate tone making it less red than most burgundy polishes I've ever used. Formula is quite amazing for such a dark shade as this applies smoothly and only took two coats and dried to an incredibly shiny finish. It's Frosty Outside is an icy, shimmering silver liquid sand shade that is made up of fine silver glitter and larger round silver glitter. The texture makes this shade really shine and the glitter pop. It's about as glitzy as you can get, but it's also very pretty. It would be particularly perfect for holiday parties and New Years. Two coats. I Snow Love You is described by OPI as being a 'Disco light confetti' which is pretty much spot on. 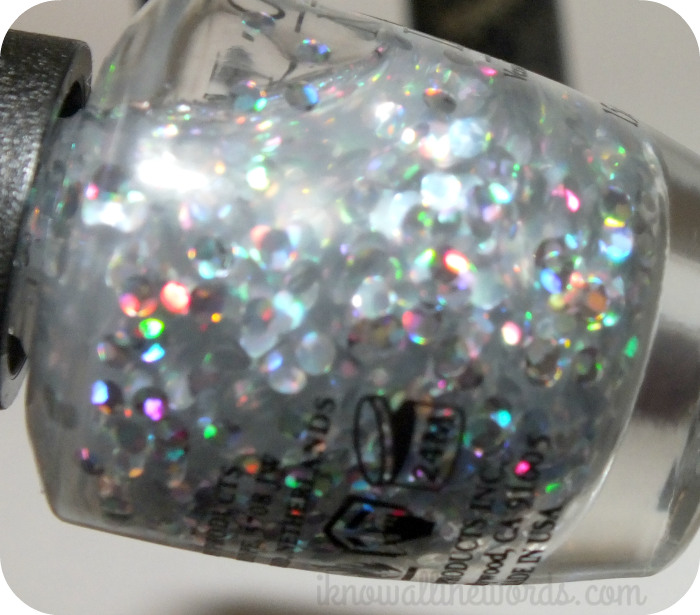 The clear base is loaded with large round holo confetti which are all kinds of amazing. They catch the light and reflect every colour of the rainbow and look like polka dots! Application is a little bit tricky, as you get too much of the clear base on the brush, but with a little patience you can get enough onto the nail. I didn't notice it in person, but the clear base does show air bubbles in the photos. In the photos I've used it over Orly Pure Porcelain. Overall, these are some great shades. I didn't expect to like I Snow Love You, but once I had it on I ended up falling in love with it. I have a feeling I might just need to pick up a few more of the liquid sand shades when this is officially released in October. Are you excited for this collection? Like any of these polishes?